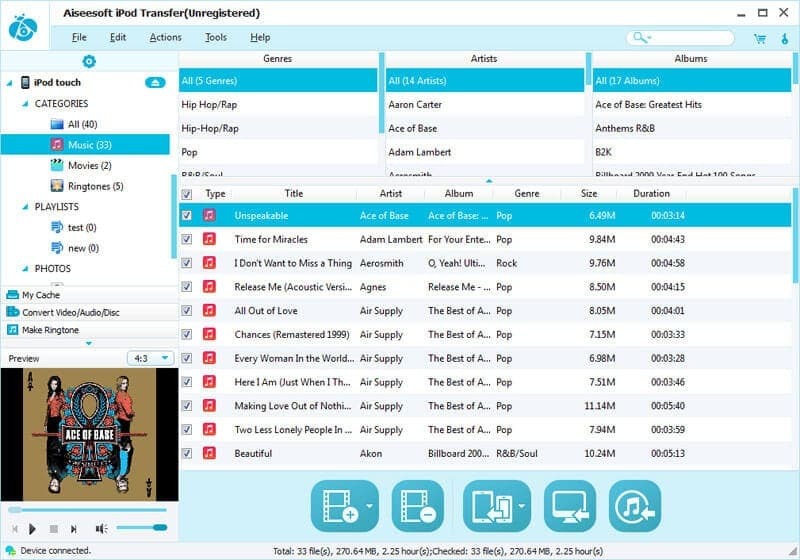 Aiseesoft iPod Transfer is the best iPod files Manager, which can help you import local videos, audios and images to iPod, and backup iPod music, movies, camera roll, pictures, voice memos, and camera shot to computer without iTunes. Also it enables you to convert those incompatible files(video and audio) to iPod compatible formats, then export them to iPod directly, even create iPhone M4R Ringtone from your videos, audios, concert recordings, MTV albums, and all popular DVDs. What's more, it is highly compatible with iOS 7, iTunes 11, iPod touch 5, iPod nano 7, iPhone 5s/5c, iPad Air, iPad mini 2, etc. Camera Roll, voice memos, camera shot files from your iPod to computer. It can help you store the converted files, so you can transfer your files any time. Connecting two iOS devices(iPod, iPhone and iPad) to computer, you can copy files from one to the other. This iPod transfer supports iPod, iPod classic, iPod nano, iPod shuffle, iPod touch, iPhone 5s/5c, iPad mini 2, iPad Air, etc. This iPod transfer can fix your device automatically if the iTunes Database of iPod has been damaged. All iPod info, including picture, type, capacity, version number, serial number, and format, will be clearly shown on the main interface. Once you connect your iPod to Computer, this iPod transfer will auto-scan your iPad files, and sort these files by Name/Album/Artist/Genre, and then you can find your files more easily. Transfer your files at super fast speed. It can save you more time to enjoy your movies and music on your iPod.